Want to sing with SUU Choirs in 2018-2019? Fill out this form. 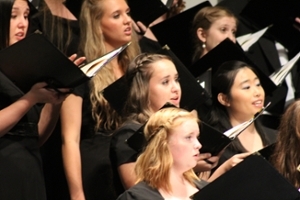 Welcome to the Choral/Vocal homepage at Southern Utah University. Whether you are going to make vocal music your career or whether you just want to continue to have music as part of your daily life at college, we have an ensemble that is just right for you. Join us, and find out why top singers from across the region and the nation have chosen SUU as the place where they want to sing! Our singers have access to outstanding performance venues, a rich and diverse cultural environment, a faculty of talented and dedicated performer/teachers, opera, major choral/orchestral works, and small and large choral ensembles. We host international guest artists such as the "King Singers", the "Chinese Opera Orchestra of Shanghai", and the "Tambuco Percussion Quartet" from Mexico just to name a few. What about travel opportunities? Some of our students and faculty just spent 6 weeks in China performing with local artists and musicians. SUU singers are active and engaged and that makes for a great education! A great education means personal and professional success. No wonder our students continue to win and place in significant competitions sponsored by the National Association of Teachers of Singing, the Music Teachers National Association, national Opera Association and the state Metropolitan Opera Auditions. A long history of musical excellence at SUU lays the groundwork for you to write the next success story! Make Southern Utah University your musical home and be a part of a dynamic, successful and growing program that thoroughly prepares you to achieve your goals. Your choice of a university is an important one - choose SUU!